No Comment is proof that even if you are a highly regarded cartoonist, represented by the biggest syndicate in the world, you can still produce a very obscure strip. Obscure enough, in fact, that I have a number of questions about it for which I've been unable to find answers. No Comment was by Vahan Shirvanian, a magazine gag cartoonist who regularly appeared in all the big markets since the 1940s. He passed away in 2013, still in harness, and was eulogized at the Mike Lynch Cartoons blog. 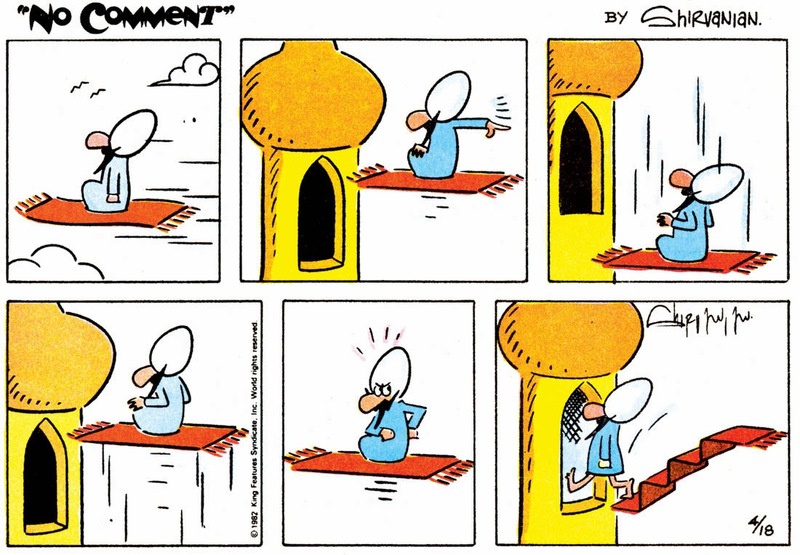 On April 9 1979, Shirvanian's first (and most likely only) syndicated newspaper strip debuted in a small client list of newspapers, syndicated by King Features. As you might guess from the name, No Comment was initially a pantomime strip. There were no continuing characters, just wordless gags from Shirvanian's vast decades-long storehouse of gag ideas. The strip veered from that formula eventually, though, when Shirvanian added a continuing character to the mix. An orange and black cat named Brimstone started to make regular appearances, and the cat had no compulsion at all to keep silent. Brimstone had such a strong resemblance in design and demeanor to George Gately's Heathcliff that I'm sort of surprised no syndicate legal eagles had words with Shirvanian. Brimstone might not have been the most original creation, but Shirvanian seemed to really enjoy the new direction of his strip. The one-off pantomime strips grew fewer and fewer and the strip's title kept seeming more and more out of place. But considering how few clients the feature had, I guess there wasn't much of an audience to notice the illogic of it. 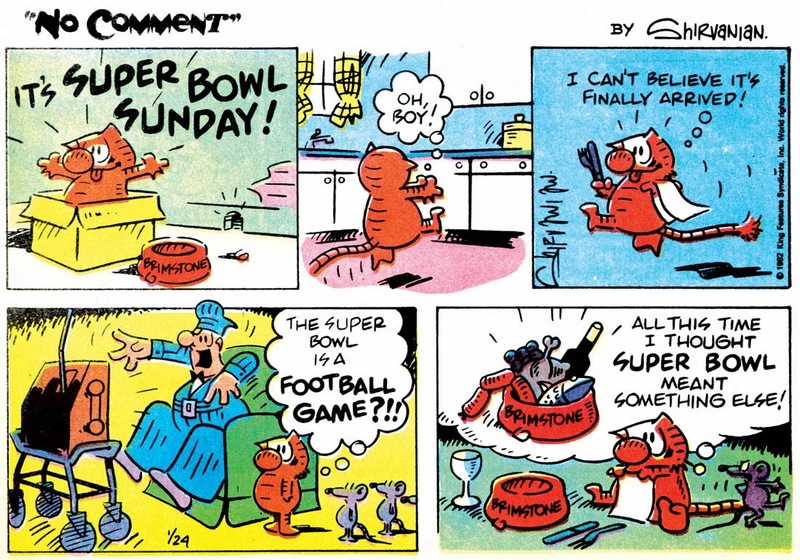 The strip seems to have sputtered to an end in 1982 -- April 23rd is the latest Sunday strip I've been able to find, and the daily may have ended in March. But then here's the weird part. There were a total of four reprint paperbacks of this obscure strip. That in itself is a bit odd. Why produce reprint books of a strip that's not doing well? My guess is that Shirvanian's contract with the syndicate stipulated that some reprint books must be offered. Okay, that makes some sense. However, it gets weirder. The first book, titled No Comment, was published in 1981. The second, though, wasn't published until 1983 -- that's well after the strip ended, as best I can tell. Surely once the strip has been cancelled all bets are off regarding book contracts, right? The second book was titled Brimstone at Work and Play, and ran only cartoons about that cat character. Was the character actually popular, or did Tor, the book publisher, think they could make some money off the occasional easily confused Garfield and Heathcliff fan? Then it gets really weird. Maybe the answer to my last question was a resounding "yes", and the second book actually sold well. 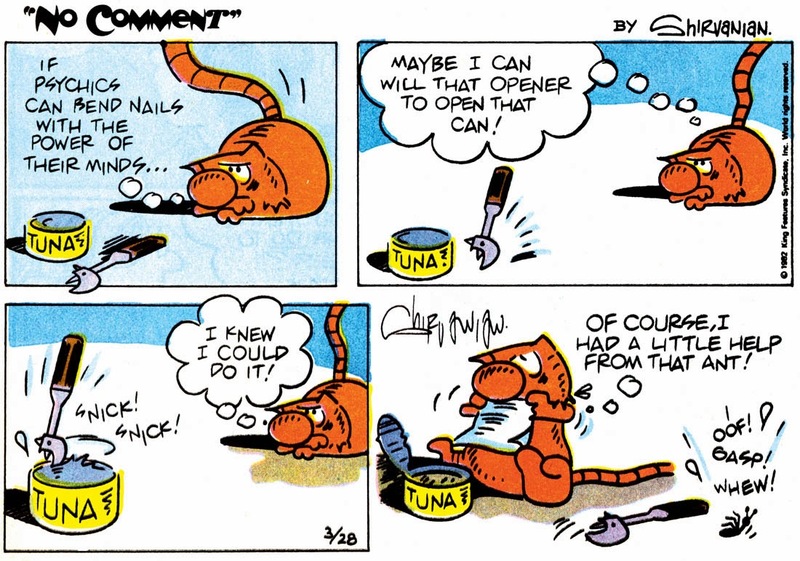 Because the final two books, Brimstone and Brimstone #2, both of which feature only the cat cartoons, were issued by Tor in 1988 -- more than half a decade after the strip ended! Did Tor see such a strong market for cat cartoon books that they thought they'd take another couple of dips from the well? This is all very weird to me. It makes me wonder if somehow I missed a surge of interest in the strip that kept it alive for many more years than I've been able to track. Maybe the title of the strip was changed to Brimstone, and maybe it was a popular item in foreign papers. I dunno! Can anyone shed some light on this stuff?